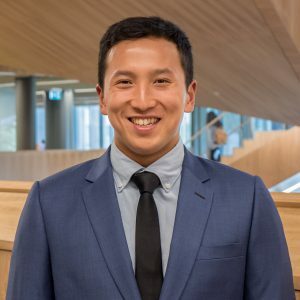 Ronald is a current 3rd year Commerce and Law student at Monash University. He is the current Vice President of ESSA and the former Marketing Director. His goal this year is to promote greater interest and engagement in Economics at Monash. What initially inspired Ronald to join ESSA was a sheer passion for the subject. However, over time Ronald came to realise that the best part about being on committee was meeting a diverse group of wonderful people that are all incredibly hard-working and talented. Since then, he has gained invaluable skills and experiences, but more importantly to him, great memories and an incredible group of friends. Ronald is a firmly believer in people, and will often prioritise the emotional well-being of his fellow committee members, over the completion of tasks. That being said, Ronald will always ensure that tasks are completed on time and to a high-level. Despite his friendly and outgoing nature, Ronald is extremely competitive, and sets high expectations not only for himself, but for the entire committee. When he’s not contributing to Australia’s GDP, Ronald will maximise his utility by playing tennis, swimming or catching up with friends. He also enjoys cycling to class in the mornings, and watching TED talks, whilst carb loading for the busy day ahead.